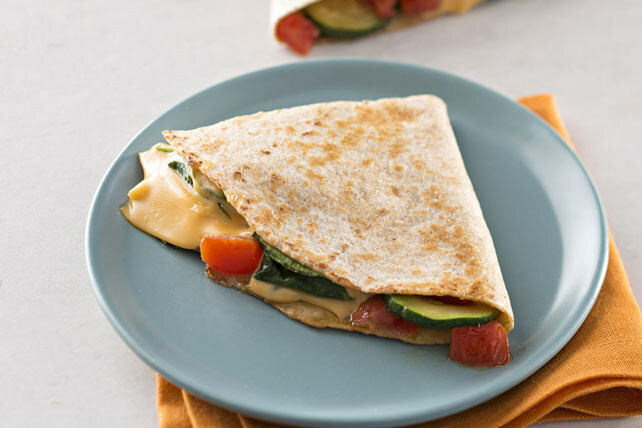 A new twist on quesadillas! Cook zucchini and tomatoes in large nonstick skillet on medium-high heat 6 min. or until zucchini is tender, stirring frequently. Top half of each tortilla with half each of the zucchini mixture and remaining ingredients; fold in half. Carefully transfer quesadillas to same skillet; spray lightly with cooking spray. Cook 4 min. on medium heat or until crisp and browned on both sides, carefully turning after 2 min. Cut in half to serve. Sprinkle 2 Tbsp. chopped fresh cilantro evenly over topped tortillas before folding in half to cook as directed.